Here are a couple of clues as to who made the list: one player recently joined the prestigious 1,000-point club and a pair of players each has 106 game-winning goals. 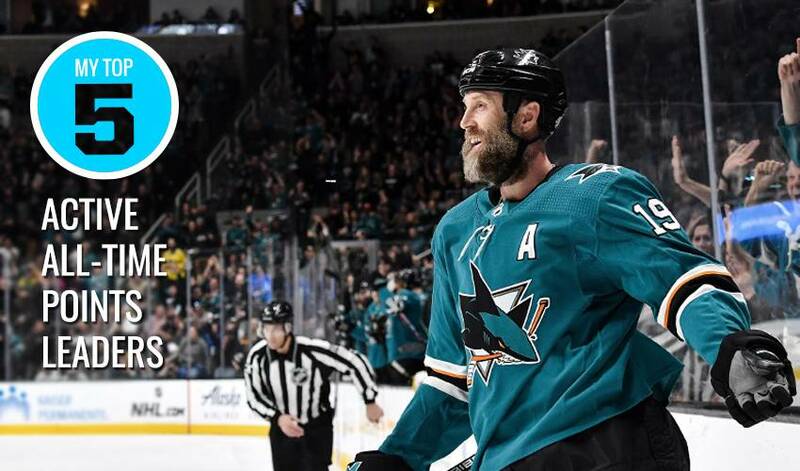 Jumbo Joe still knows how to provide a spark for the San Jose Sharks. One of the best passers in hockey, the 39-year-old has 1,060 assists over his Hall of Fame-worthy career, averaging .679 helpers per contest. A three-time Ted Lindsay Award recipient, Sid, less than 65 games away from 1,000 in his career, averages a whopping 1.290 points per game. The pride of Cole Harbour, Nova Scotia, is also averaging .817 assists per game. The great No. 8 just keeps on rolling, leading all active goal-scorers with 655 tallies. Ovechkin is tied with the ageless Patrick Marleau when it comes to active game-winning goal leaders, with each forward notching 106 lamp-lighters. After swimming with Sharks, Marleau turned over a new leaf as a member of the Maple Leafs. The smooth-skating veteran forward has 551 lifetime goals, 169 power-play goals, along with 17 short-handed tallies. Pittsburgh’s top-shelf forward picked up his milestone 1,000th point March 12 in a game against the Washington Capitals. The 32-year-old, who was awarded the 2012 Ted Lindsay Award, is 50 games shy of 900 for an NHL career that includes three Stanley Cups.